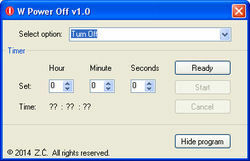 W Power Off is a tool that allows you to schedule when a computer should Shut Down, Restart or Hibernate. It lets you define a number of hours, minutes and seconds. In order to schedule an action, you need to input the number of hours, minutes and seconds after which to shutdown or restart, press the 'Ready' button, followed by 'Start', which will begin the count down. You can hide the application in the background.